Here is a sample of new products we’ve added to our inventory. 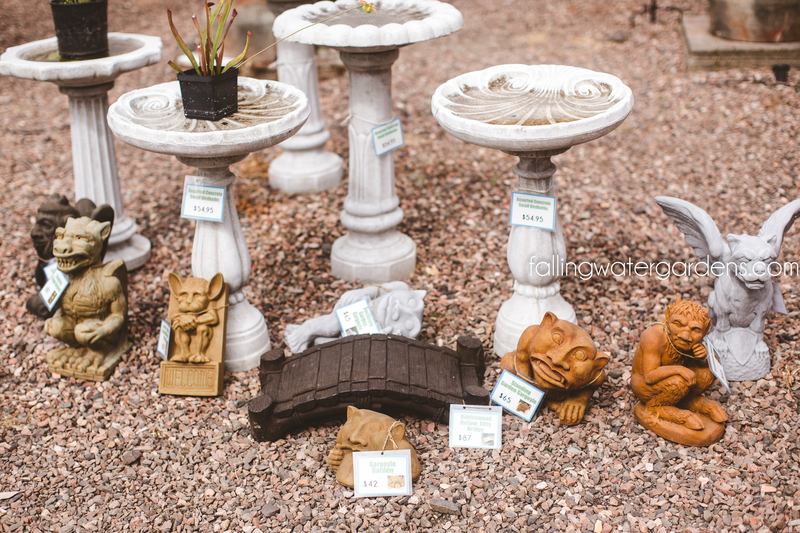 Be sure to visit the nursery to see ALL of the latest products and plants! Recently added these gargoyle statues to our inventory. Prices vary. This overindulging frog awaits his next meal. What’s it going to be?! $50. Create a relaxing environment in your garden. 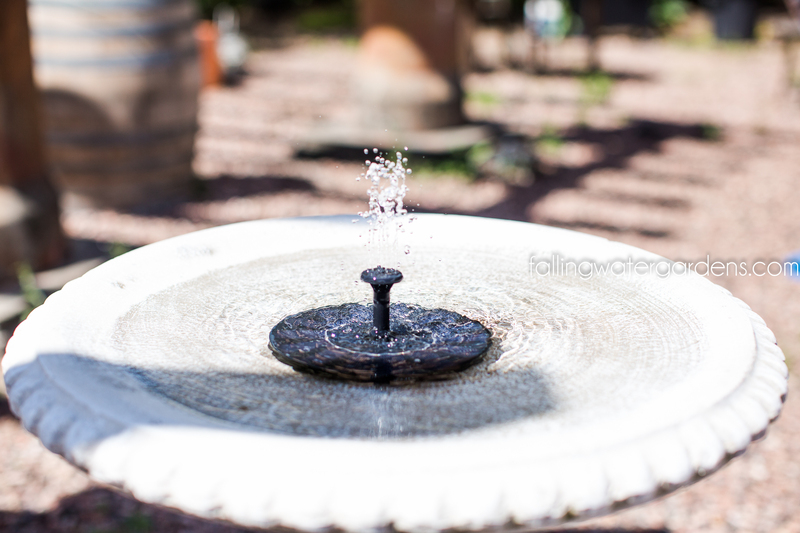 Solar powered fountain pump kit for fountains, waterfalls and water displays. Runs automatically, no battery or electricity needed, works in full sun only (not shade or cloudy day). Comes with different spray heads for replacement. $34.88. Clean your shoes with this chill-looking dragon brush. Perfect for the entrance to your home after a long day working in the garden. $58. Any spaniel fans out there? 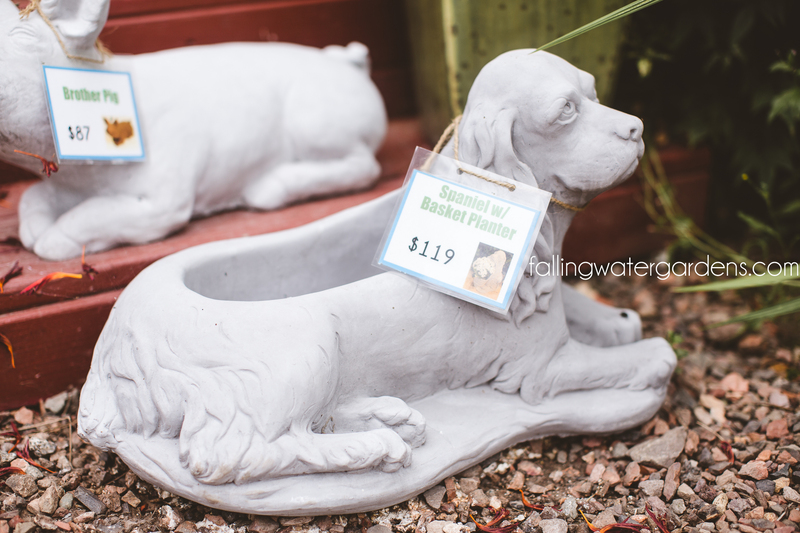 This is such a darling planter! $119. 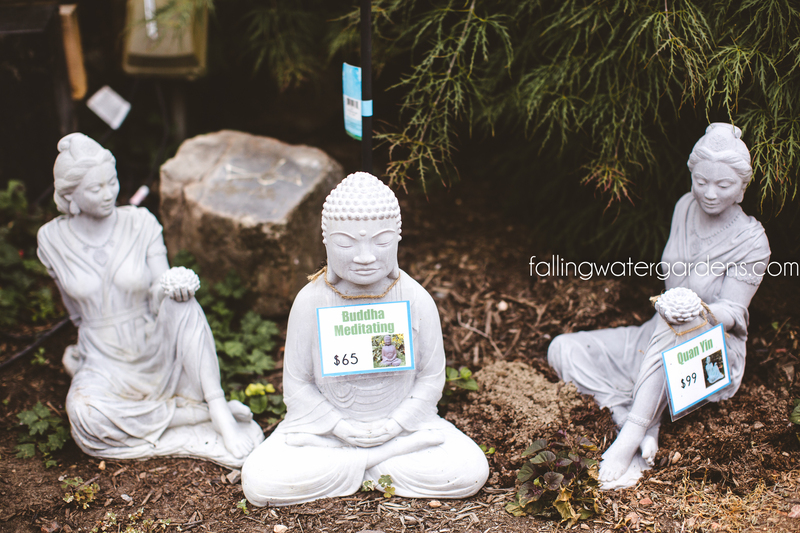 This detailed Buddha statue adds a of touch of serenity and spiritual inspiration to your outdoor space. Hands gently placed in lap in the Dhyana Mudra, Buddha meditates with deep concentration. It seems as if nothing in the world could disturb him! $65. For those who wish to give a symbol of peace, or strength, of beauty. Our sculpture is a gift with meaning with this Quan Yin Statue. 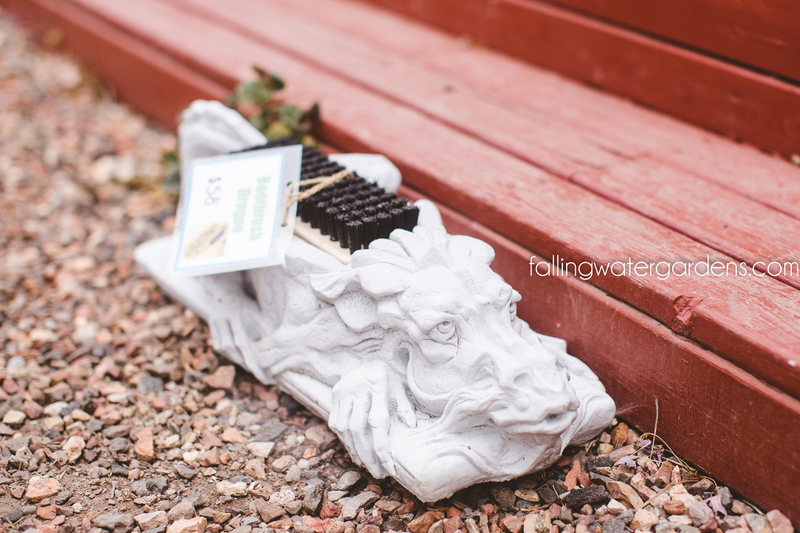 This statue is crafted from a durable long lasting stone, designed to last outdoors in all weather conditions for years to come. $99. 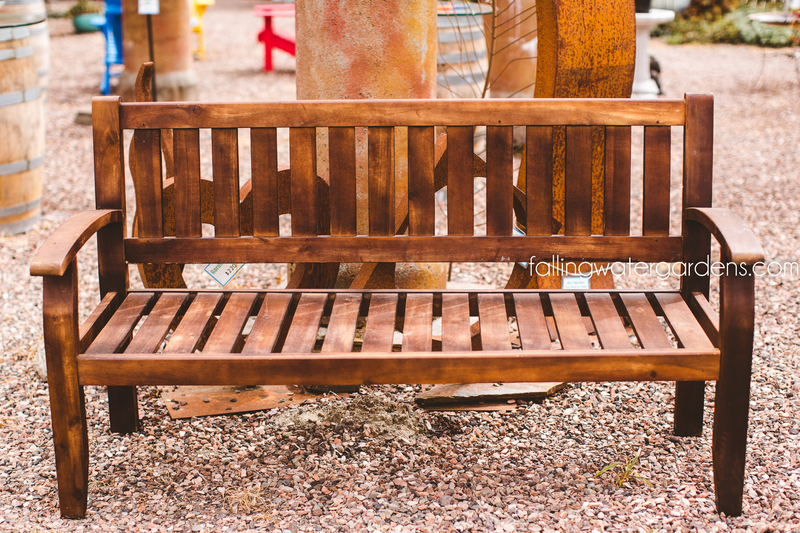 You and your guests can relax comfortably on this gorgeous acacia wood bench. We only have one in stock! $395. Do your future self a favor by making that investment to ensure the clarity of your pond. These high output ultraviolet clarifiers provide pond owners with optimum water conditions and boasts crystal clear pond water. The unique design minimizes maintenance and maximizes the efficiency of mechanical and biological filtration. 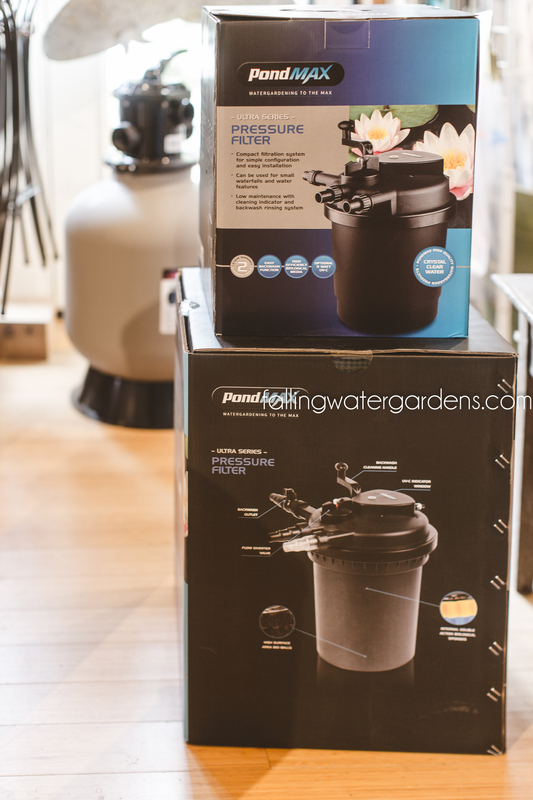 These pond pressure filters are equipped with a cleaning indicator, to help tell you when the right time to clean is, and backwash functionality. Set yourself up for success the rest of the season and for next year! Prices vary. Don’t forget to take a peek at the items on the discount table in the gift shop! 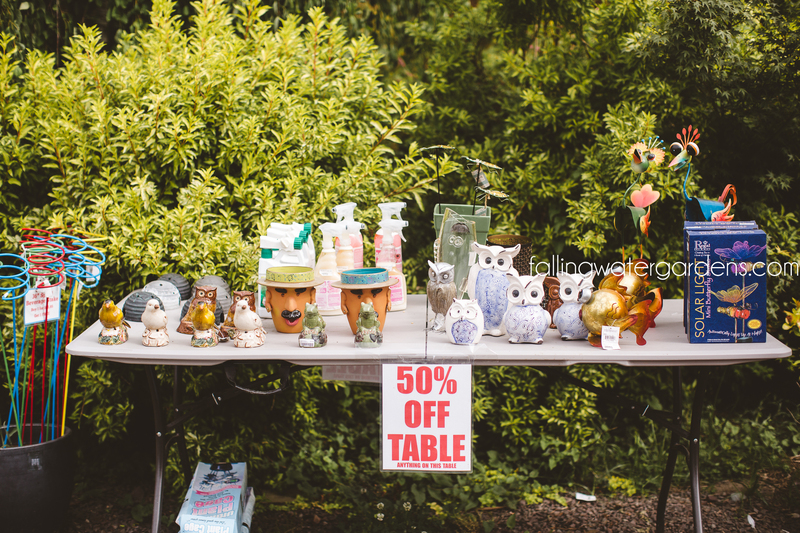 We still have all sorts of goodies that are marked at 50% off! 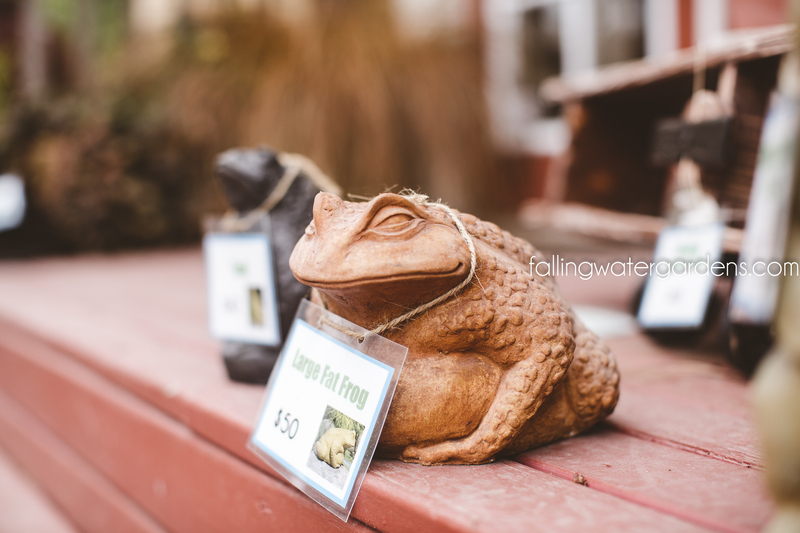 **Many of the items offered at Falling Water Gardens are limited quantities and cannot or will not be reordered. If you love it then make sure to visit us and take it home before we sell out!